Born at the crossroads of East Creek in Montgomery County, New York, December 20, 1825. 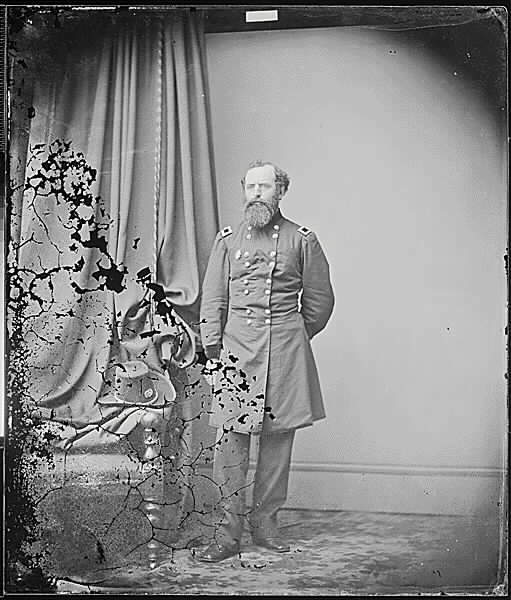 His father, a country physician, trained him so thoroughly in Latin that was regarded as an authority in it among cadets at the United States Military Academy from 1843 until his graduation in 1847, 22nd in class of 38, and assigned to Artillery. He served in the Mexican War, on the frontier, and in Eastern garrisons and promoted to Captain, 5th US Artillery, May 14, 1861. He fought at 1st Bull Run and served as Chief of Artillery for W. F. Smith's Division, October-November 1862, and VI Corps, Army of the Potomac, to April 1863. In these positions he was at the siege of Yorktown, Lee's Mill, Williamsburg, Gaines's Mill, Golding's Farm, Glendale, Harrison's Landing, South Mountain, Antietam, and Fredericksburg. His first wife was Emily Louis Gerry Dearborn, born 8 May 1829 in Bangor, Penobscot, Maine. Married 14 August 1849. His second wife was Juliet Opie Hopkins Butcher, the daughter of Juliet Opie Hopkins. Promoted to Brigadier General, United States Volunteers, November 29, 1862, he took command of 1st Brigade, 2nd Division, V Corps, Army of the Potomac, April 21, 1863 and led it at Chancellorsville. He commanded the Division at Gettysburg and during the New York Draft Riots. He fought in subsequent actions of V Corps, commanding 4th Brigade, 1st Division, March 1864, 1st Brigade, 1st Division, from the Wilderness through Cold Harbor, April-June 5, 1864, and commanded 2nd Division, June 6, 1864-January 1865, at Petersburg where he was wounded. 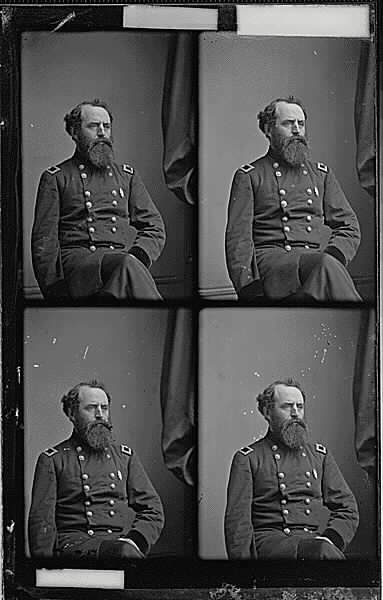 He also commanded 3rd Division, Provisional Corps, Army of the Potomac, June 28, 1865, and District of Shenandoah, August 23, 1865-April 30, 1866. He was brevetted for Gettysburg, the Wilderness, as Major General, United States Volunteers,, for the Wilderness, Spotsylvania, Jericho Ford, Totopotomoy, Bethesda Church, Petersburg, Globe Tavern, Weldon Railroad, 5 Forks, Brigadier General, United States Army, for war service, Major General, United States Army. He was described as tall, distinguished, meticulous in dress, and a hard fighter. He continued in the regular army until his death on active duty as a Colonel. He served in garrison in Puebla and Mexico City after active hostilities in the Mexican War had ceased, and then had routine duty in many sections of the US. Advanced to Captain of 5th Artillery on May 14, 1861. Commanded artillery battery at 1st Manassas, continued with Army of the Potomac until surrender at Appomattox. With the contraction of the Regular Army in 1870's, he performed garrison duty at number of posts, including Little Rock, Arkansas, Jackson Barracks, Louisiana, Key West, Florida, and other places in the South. July 15, 1879, promoted to Colonel of the 2nd Artillery, and supervised various army posts in Florida. Died: Ft Hamilton, New York Harbor, December 4, 1888. He was the son-in-law of Juliet Opie Hopkins, she is buried with him in Section 1 of Arlington National Cemetery. January 29, 1880 – St. Thomas’ Church was the scene of a wedding ceremony yesterday afternoon at 5 o’clock which, for the military celebrities present in full uniform, recalled the days of the war. The groom was Major General Romeyn B. Ayres, who served with distinction during the war. 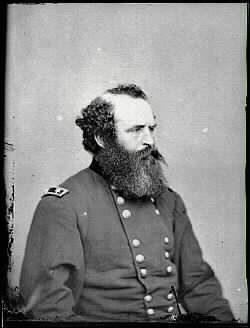 Entertaining that struggle in 1861 as Caption of the Fifth United States Artillery, he was mustered out of the service in 1865 as Major General of Volunteers by brevet and transferred to the regular army as Lieutenant Colonel of the Twenty-Eighth Infantry. A native of this State, General Ayres was graduated at the Military Academy at West Point in 1847 with the rank of Brevet Second Lieutenant and assigned to the Fourth Artillery. In 1852 he was promoted to First Lieutenant and in 1861 was made a Captain and assigned to the Fifth Artillery. General Ayres has recently been assigned to the command of Fort McHenry, the scene of one of the most brilliant actions in the War of 1812. The bride, Miss Juliet Opie Hopkins, a beautiful brunette, is the niece and adopted daughter of Mrs. A. F. Hopkins of Mobile, Alabama, who has been spending a portion of the Winter in this City, and the daughter of Mr. R. H. Butcher of Virginia. The bridal toilet was one of the most beautiful and tasteful of the wedding season, being of the fashionable tine of silk familiar to modistes as creame white, cust en traine, and trimmed with fleecy clouds of lace. A bridal veil fastened with a wreath of orange blossoms and a magnificent bridal bouquet completed the toilet. The affair was a very quiet one, but lone before 5 o’clock the central space was completely filled with officers in uniform, civilian friends and relatives, and fashionably dressed ladies. There were no bridesmaids, but eight ushers in uniforms, who escorted the guests to their seats. 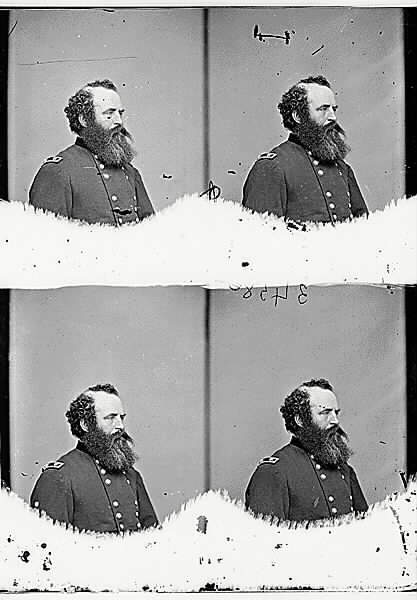 Their names and ranks were as follows: Colonel J. S. Fletches, USA; Captain Chambers McKibbin, Fifteenth Infantry; Captain G. F. Barstow, Third Artillery; Captain Joseph M. Calef, Third Artillery; Captain James Chester, Third Artillery; Captain, H. H. Sudlow, Third Artillery; and Captain Benjamin H. Randolph, Third Artillery. The two former were members during the war with General Ayres’s staff, and consequently belonged to the Second Division – Regulars – of the Fifth Army Corps, in command of which General Ayres distinguished himself as a brave and brilliant officer. Colonel H. G. Litchfield, USA, an old comrade in arms, performed the duties of best man, and was master of ceremonies. The bridal party arrives promptly at 5 o’clock. BROOKLYN, New York, December 7, 1888 – Yesterday afternoon in St. John’s Church at fort Hamilton, while the rough wind played a dirge about the little edifice, the Rev. Dr. R. B. Snowden read the funeral service over the body of the late Brevet Major General Romeyn B. Ayres, Colonel of the Second United States Artillery, who died at the Fort on Tuesday. At the conclusion of the services, the choir sang the General’s favorite hymn, “Thy Will Be Done,” and the coffin, draped with the American flag and with the General’s sword and belt lying on its lid, was borne to a gun carriage standing before the church. The pall bearers were Colonel Alexander Piper, Commandant of the Fort; General Israel Vogdes, General C. H. Tompkins; Colonel Mordecai, Colonel Sutherland, and Colonel Lodor. About 250 officers and men of Batteries E, H and I of the Fifth Artillery and of Batteries K and M of the Second Artillery were drawn up along the road at salute as the coffin was placed on the carriage, and then led the way with draped colors and reversed arms, keeping time to the dirge played by the Light Battery Band, to the wharf where the steamer Chester A. Arthur lay waiting. As the boat left the dock on its was to Pennsylvania Station at Jersey City the cannon boomed out a Major General’s salute of 13 guns, the soldiers brought their arms from reverse to shoulder, the band broke into a lively march, and the wind-swept pier was quickly deserted. The interment will take place this afternoon at Arlington Cemetery in Washington, D.C. Among those present at the church were Colonel Best, Captain and Mrs. Crab, Captain Zalinski, Lieutenant Whistler, Colonel John Hamilton, Lieutenant Treat from Fort Wadsworth, and Captain Morris of the Loyal Legion. Lieutenant Vogdes and a guard of men accompanied the body to Washington. Mrs. Ayres is lying dangerously ill at the Fort from the shock of her husband’s death, and all of the General’s children are stationed at far-away posts, so that the only relatives of his at the funeral was his daughter-in-law, Mrs. Charles Ayres. Charles Greenlief Ayres, Colonel, United States Army (1854-1909): The general's son. Henry Fairfax Ayres, Lieutenant Colonel, United States Army (1885-1979): The son of Charles Greenlief and the general's grandson. Mary Elizabeth Fairfax Ayres (1859-1909): The wife of Charles Greenlief Ayres and the mother of Henry Fairfax Ayres. Juliet Opie Hopkins (1818-1890): The general's mother-in-law and know as the "Florence Nightingale of the South" due to her service to the hospital systems of the Confederacy during the Civil War. Click on her name for more information about her.